Is it a car, is it a bird...? Mystery surrounds the sighting of a Fundraising Regulator-branded car on a road near Bristol. Daniel Francis, a senior governance consultant at the National Council for Voluntary Organisations, tweeted a photograph of the vehicle overtaking him. But the regulator tweeted back: "We don't have any branded (or unbranded!) cars, so we’d love to know more about who this is. If you spot it at the carwash, do let us know!" The post led to another alleged sighting of the vehicle along with jokes that Gerald Oppenheim, chief executive of the regulator, had been caught speeding. Francis said he had not fabricated the incident. "Promise I have 0 photoshop skills," he tweeted. He added he got part of the registration plate, which he had passed on to the regulator. 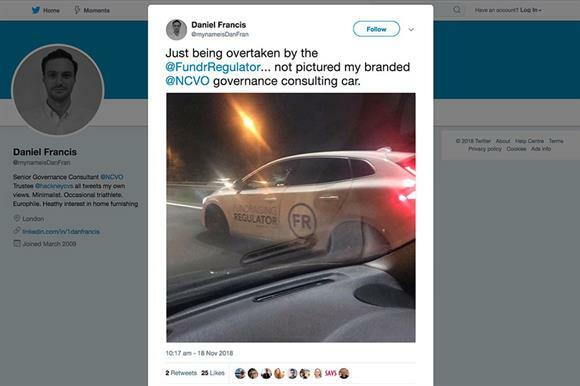 Francis, who was in the passenger seat at the time, joked that his photograph did not show his NCVO governance consulting-branded vehicle. Asked to comment on the sighting, the regulator referred Third Sector to its Twitter comment.